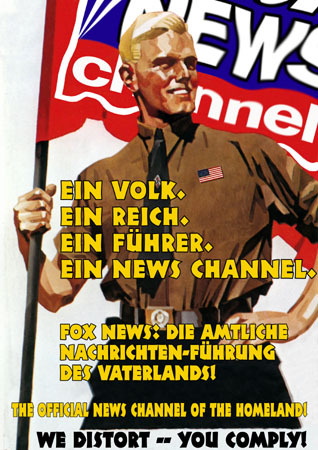 Fox "News" was the Ministry of Disinformation for the Cheney administration, and it has become entrenched as the default source in the Washington D.C. area. (and how could it possibly be more "mainstream media" than that?) Its constant drumbeat of fear and outrage dovetails with the economy of the Washington area. The Military-Industrial Complex and its newer cousin the Intelligence-Industrial Complex both need a continuing large flow of funds. The more you keep everyone terrified, they more they want to throw money at all these threats. The delusion and fear even get in the way when you're trying to teach someone about information technology. In one class we were discussing content delivery networks. A very short informal exercise had them look at how media-rich web sites use this technology. Or at least it was supposed to be short and informal. Of course it went off the rails and ran longer. The course ran primarily in the U.S. and the U.K., so this would give the typical student the choice between the sites of iconic television and print organizations. Of course, "iconic" to me might mean "subversive" to the politically zealous. After a brief look at the layout of the page, they were to right-click on one of the images and select "View Image". They would then make a note of the hostname serving up the image, noticing that it wasn't the same host that served up the main page. For example, the www.cnn.com page contains images served from cdn.turner.com. They could then verify how that was happening by going back to the page, right-clicking on the text and selecting "View Page Source". You might think "Oh, yes, Ted Turner founded CNN", but dig deeper. Look up that host's IP address with the nslookup command, and then turn around and look up the fully qualified domain name associated with that IP address. You find that CNN web image and video content is hosted at footprint.net, BBC and Time use akamai.net, and The Economist uses panthercdn.com. An earlier version of the course had explained the process briefly, but of course that did not work in the U.S. and the steps had to be fully spelled out, showing them precisely what to type and click. No, I'm quite certain that it does work. Let's see what you're doing. Huh, that's strange. I don't know why you're getting a completely different IP address than anyone else in the room. "Well, of course I wanted to use this", as he pointed to the partially hidden browser showing the www.foxnews.com page. Ah. "Of course", as you say. Well, I don't know exactly what happens if you start with that URL. They probably use a content delivery network, but the CDN hostname, IP address, and the results of the reverse lookup are going to be completely different. Look, pick one of the four in the notebook, we know that they all work when you're following this precise set of steps. "But I really need to look just at this one", as he pointed to the Fox "News" page. It looks like the precise details are a little different for that site. Try one of the ones listed in the exercise manual. "No, I really to just look at this site, instead of, well, ... those. I can't look at them." Really? We're just asking you to look at some <img src="..."> HTML code and do a couple of DNS lookups. "Well, that's OK. I guess I'll just skip this exercise." If you ask me, he is pretty worried about the weakness of his political faith if it is threatened by a brief glance at a page and a few DNS lookups. Meanwhile, I have never had a student insist that they can only allow themselves to look at the NPR and PBS web pages. Maybe liberals have stronger political will. Or maybe neocons are just stupid. World Public Opinion, a project managed by the Program on International Policy Attitudes at the University of Maryland, conducted a survey of American voters in late 2010. Their study showed that Fox News viewers are significantly worse misinformed than consumers of other news sources. Additionally, the study shows that greater exposure to Fox News increases misinformation. For example, 63% of Fox viewers believe that Barack Obama definitely was not born in the U.S., or that his birth place is unclear. 60% believe that world climate is not changing. See that late 2010 survey here, and also see earlier similar results from WPO's 2003 survey and also a 2009 poll by NBC and the Wall Street Journal. More recently, a May 2012 study by Fairleigh Dickinson University showed that people who watch nothing but Fox News know less about both international and domestic events than people who watch no news at all.